We are airport experts! 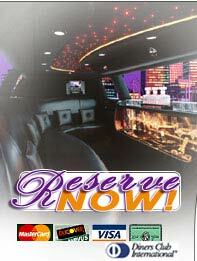 Make reservations for your arrival or departure flight and we will pick you up or get you to the airport on time. We track your arrival flight and watch for any delays or early landings. We will promptly pick you up curbside or if you require a "meet and greet" inside the terminal (extra charge) our Chauffeur will be there. Our limousines, sedans, vans and busses are available for charter on an hourly basis (2,3 or 4 hr. min. apply) or charter by the day. We can help plan the logistics of the charter or our Chauffeur will drive as directed. If you are coordinating a corporate meeting, group event, entertainment event, corporate tour, or large conference we can help you plan your event, no matter what the size. You provide the details and we'll create a manifest detailing the most cost effective method of providing your transportation. Check out our “Packages” page and if you don’t see a package that your interested in call us and let us know what you are looking for. We will create a custom package just for you! Nobody gets you from point A to point B like we do. Enjoy the privacy, style and safety of our vehicle while making telephone calls, finishing a proposal or just relaxing and enjoying the ride. Our account representatives will handle your account on a personal basis. Corporate accounts will be set up and customized to your specifications. From reservations to billing, we treat you right. Check out our "GIFTCARD" page as many of our corporate accounts offer our customized gift cards as incentives to their employees and as a treat for their customers. Desert Knights - Proving transportation solutions one ride at a time. - Copyright © 1999-2006 All Rights Reserved.